Balance. The kind of state we all are struggling to harmonize ourselves into. Be it work, social life and of course our fuel, food. Our health is most certainly one of the deciding factors for achieving this balance after all, health is the relationship between you and your body. We all know that maintaining a healthy body is a great responsibility and involves a great extent of effort along with trying not to cater to our cravings. Even after being so aware of how important a healthy body and mind is, we often find ourselves making poor choices in terms of what we eat. SEE ALSO: Save 10% on your next healthy meal with Let's Cook! If you sit back and reflect these choices, there is a huge influence of the “convenience” factor into it. We really want to prepare a nice healthy meal with all those fresh, wholesome ingredients but we don’t find the time to go through the entire process of go carting in the supermarkets. Let’s Cook not only brings you healthy eating options but also brings in the convenience of delivery to your door. 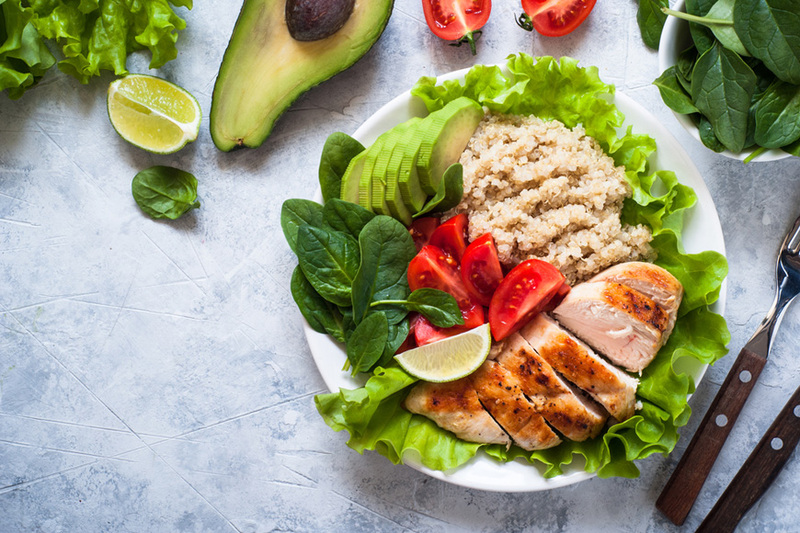 To incorporate a balanced diet into our lives we simply need to start by understanding the foundation of nutrition and its effect on our health. Macronutrients are that group of nutrients that your body requires in larger quantities, hence the term “macro”. All Macronutrients release calories that fuel your body with energy. 1. Proteins are the building blocks of the body. They are used to build and repair tissues. They help you fight infection. Your body uses extra protein for energy. 1 gram of protein supplies 4 kilocalories. 2. Carbohydrates are the body’s main source of energy. It also helps in the regulation of blood glucose. Many carbohydrates supply fiber which can help improve the health of your digestive system. 1 gram of carbohydrate supplies 4 kilocalories. 3. Fats are a major source of energy and helps absorbs some vitamins and minerals. They also help in the regulation of the core body temperature. 1 gram of protein supplies 9 kilocalories. Food is not just fuel, Micronutrients are components that the body needs in smaller amounts, hence the term “micro”. They consist of vitamins and minerals which are very essential for certain body functions. Even though they are required in miniscule quantities, they have a profound impact on our health. The WHO calls micronutrients the “Magic Wand” that enable the body to produce enzymes, hormones and other substances essential for proper growth and development. Minerals include – Sodium, Chloride, Potassium, Calcium, Sulfur, Magnesium, Selenium, Iron, Zinc, Iodine, Copper, Manganese, Chromium, and Molybdenum; who knew half of the periodic table would be involved in our daily diet. Foods containing a combination of these micronutrients are called nutrient-dense foods, these will be relatively low in calories. Though our body requires these nutrients in trace amounts, we have to keep in mind that their presence in the amounts needed in the body are not an indication of their significance. Now that we have a good understanding of the basic nutrition framework, it will be easier for us to plan a diet keeping in mind the above information/ facts. Remember all food choices matter and making the right choices will be the key to achieving one part of your balance! To learn more and get in touch with the Let's Cook team, simply press 'click to contact'! Don't forget - Let's Cook are offering a special discount code for ExpatWoman readers who use their service! Simply use the code EW10 upon check-out to avail a 10% discount on your purchase.